Mohamed Salah: Is Liverpool striker's success improving engagement with Muslim fans? Mesut Ozil, Mousa Dembele, Riyad Mahrez, Paul Pogba and Mohamed Salah are among the Muslim players now starring in the Premier League. Their faith can be seen in their mannerisms on the pitch - cupping hands in silent pre-kick-off prayer or prostration after hitting the back of the net. For Salah, who has 23 Premier League goals for Liverpool this season, his religion has become the unlikely inspiration for some Liverpool fans to rewrite the lyrics to 1996 hit Good Enough by Dodgy. The words of the chorus are adjusted to celebrate the feats of the Egyptian striker: "If he's good enough for you he's good enough for me, if he scores another few then I'll be Muslim too. If he's good enough for you he's good enough for me, he's sitting in the mosque that's where I wanna be." A video posted on Twitter with a group of Reds fans performing the song went viral, and tens of thousands of hits later even non-Liverpool fans have put allegiances aside in praise of the video and its lyrics. In his hometown of Besayoun near Cairo, Salah would have been four years old at the time of the song's original release so it is unlikely that he would have heard it then. The 25-year-old has certainly heard it now. The video has received mainstream media coverage and Liverpool fan and club member Asif Bodi believes it is an exercise in inclusivity. He likes the song's message and is adamant that Salah and the video have had a unifying effect in Liverpool, which was the home of solicitor William Quilliam, the first English Muslim convert to Islam in 1887, and where he opened the UK's first mosque and Islamic centre. "The Mo Salah song shows how tolerant and welcoming the people of Liverpool really are. Historically Liverpool has a reputation of welcoming visitors and also is the site of one of the first mosques in the British Isles," said Bodi. "It's great to see all the positive outpouring of affection towards Mohamed. I would get behind any Liverpool player but I can't hide my pride that Mo is not only a great Liverpool player but he is also a fellow devout Muslim too." A regular at Anfield, Bodi is part of a large number of Muslims who support Liverpool, and he says Salah's performances and goals have seen that number grow. "The success of Salah has also led to an increase in the Liverpool fan base in the UK and around the Muslim world. I was pleased to hear of a 10-year-old Manchester United fan who became a Liverpool fan because of the song. That can only be good," he adds. Like Salah, German World Cup winner Ozil is proud of his religion and happy to show it on the pitch. "I'm a Muslim, I believe in that. You can see before games that I pray and that I'm pleased to be able to go on this path. It gives me a lot of strength," he said. "I'm someone who's always been thankful, someone who doesn't just wish the best for me but for the people. It's a very important part of my life. What's important is to come together and show respect." Like an increasing number of grounds in the Premier League, Arsenal's Emirates Stadium incorporates a multi-faith fans' prayer room. When a prayer time arrives during a match, fans have a place to congregate safely to focus on their faith for the few minutes it takes before returning to their seats. Arsenal's Muslim fans and matchday staff cram into their tiny concourse room to offer their prayers. In September 2016, the new main stand at Anfield was completed and a multi-faith fans' prayer room was included in the redevelopment. This was not only in response to the diverse needs of the Liverpool fan base, but also in response to a previous experience for Bodi and fellow solicitor and Reds' Muslim fan Abubakar Bulla in 2015. Images of both Bodi and Bhula praying at Anfield caused a storm on Twitter with one Liverpool fan tweeting "Muslims praying at half-time at the match yesterday. #Disgrace." Liverpool were swift to distance themselves from that comment and condemned the tweet, as did other Liverpool fans on social media. 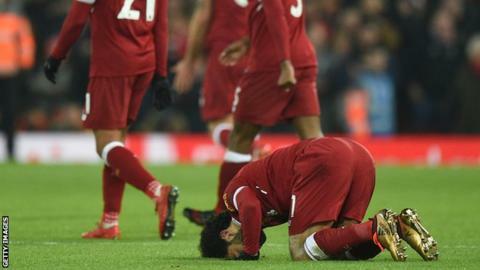 Looking back, Bodi and Bulla wonder if those fans who had a negative view on their praying are now the same fans cheering loudly as Muslim striker Salah smashes in another goal and breaks another goal-scoring record, all celebrated with an on-field prostration to his faith. "I now think that the negative Twitter reaction to our praying was the reaction of a very small minority, and the Mo Salah song displays the true feelings of Liverpudlians," reflected Bodi, who praised Liverpool's fans' prayer room. "This facility has undoubtedly led to a greater number of Muslims attending games. Its success can be judged by the fact that it has been outgrown with many more people wishing to use it than it can accommodate at any specific time." In east London in October 2013, during a game between West Ham and Manchester City, a small group of home Muslim fans - with no prayer room available - tried to offer their Maghrib (sunset) prayer on a concourse under the main stand at the club's former home Upton Park. Videos later emerged on social media of the group suffering horrific racist and Islamophobic abuse. Spurred into action, and to avoid any future misunderstandings, the club ensured that their new home, London Stadium, would have a multi-faith prayer room. Over in the West Midlands, the borough of Sandwell has been described as one of the most deprived areas in Britain. Hard-working white and ethnic minority communities live and work here in a catchment area for West Bromwich Albion. A stone's throw from The Hawthorns is Oldbury, home to Baggies fan Ashley Rawlins. A season ticket holder, Rawlins embraced Islam in 2012. He likes the Salah video, and is well positioned to empathise with fans' understanding on all sides while saluting the performances of Albion's own Muslim players. Ahmed Hegazi was joined by fellow Egyptian Ali Gabr in January. "I've been on both sides in regards to the Muslim community and seeing the Mo Salah tribute song from Liverpool fans has been such a positive thing," he said. "It shows that football is bringing people together as you wouldn't have seen something like this a few years ago, especially people singing 'sitting in a mosque is where I wanna be'. "At my club, we have a similar story with regards to Ahmed Hegazi. He is so well received, his bravery in the games has been inspiring and as a result the fans love him. I have his name on the back of my shirt and he is definitely a conversation starter." In quick time Rawlins, a manager at the Ministry of Justice who also plays semi-professional football, has achieved a greater knowledge and understanding of Islam than many born into the faith. In his office, the 29-year-old is happy to share his knowledge on Islam when he gets asked questions by his fellow workers. "At work, I have regular conversations with my team and there is interest in Islam. They ask many questions which I'm happy to answer. If I don't know the answer, I find out and get back to them," he said. Away from the top-flight teams, community based clubs need their local fans to turn up and support their team, and if that club is located in a predominantly Muslim community, Rawlins urges them to also attend matches. But he warns that if the clubs want them to return they will need to address the additional needs, especially when it comes to matchday catering. "Muslim fans should definitely go to matches to show the general public that there are so many similarities between us, regardless of faith," he says. "I do, however, feel football clubs with a mixed demographic fan base could do more to address the lack of prayer facilities as this is a fundamental part of our faith and many others."